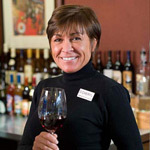 Cheryl’s passion for wine began to develop while living in Europe in the 80’s and early 90’s. During the years to follow, she’s taken many wine classes, done much self study and received her internationally recognized Wine and Spirit Education Trust (WSET) certification. She teaches wine education classes at the New York Wine and Culinary Center, she’s the Wine Coordinator at the Canandaigua Wegmans, and the Riedel Representative to the NY wineries in the Finger Lakes and Long Island.